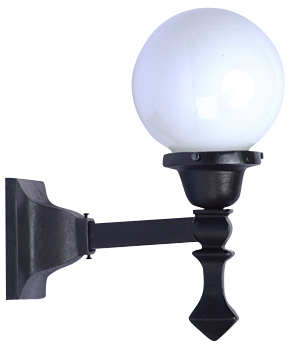 Large cast iron Craftsman or Mission style sconce porch light - comes complete with a milk glass round style shade and a vintage style porcelain light bulb fitter. Completely wired and ready to mount. Measures 13 inches tall (with shade) and has a projection of 10 1/2 inches. The back plate measures approximately 4 5/8 inch square. Solid iron construction. 75 Watt bulb maximum.